This was a warm-up trip and reconnaissance of the hike out for our planned complete traverse of the Picket Range later that summer. We had a great trip. Not only did we have stellar weather, but we summited three peaks, successfully negotiated the Barrier crossing, and scoped out the descent route from Crescent Creek Basin to the Goodell Creek trailhead. Everything in the Southern Pickets just begs to be climbed. 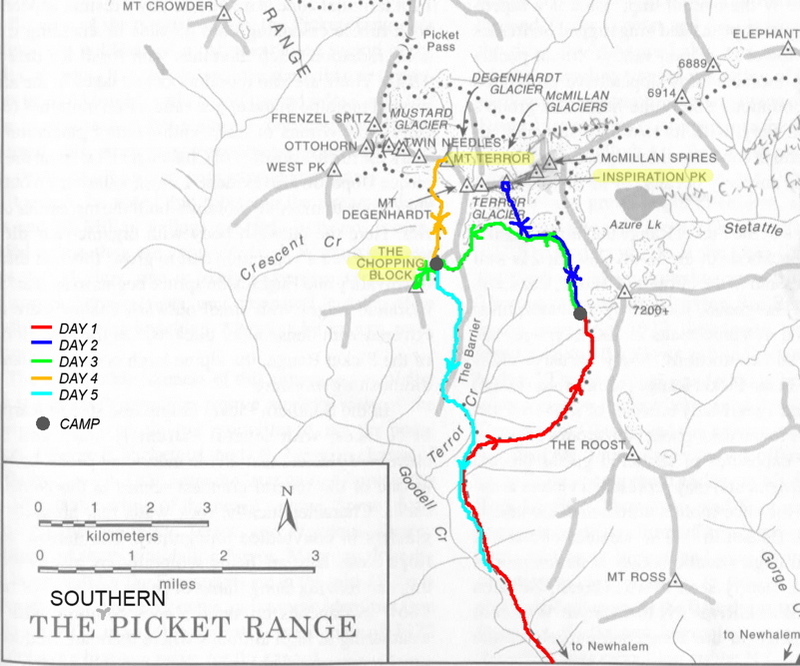 A schematic of the Southern Pickets (from Beckey's guide) showing where we went on our 5 day adventure. The Southern Pickets from the south (as seen from the summit of the Chopping Block on Day 3). The trail begins at the group campground on Goodell Creek (elev. 600ft), and follows an old roadbed for about 4 miles. A stone arrow at the end of the old roadbed along Goodell Creek marks the turnoff to Terror Creek Basin. From here (elev. 1,700ft), a boot-beaten path climbs steeply up the hillside to where it breaks out of the trees at around 5,000-5,200ft. 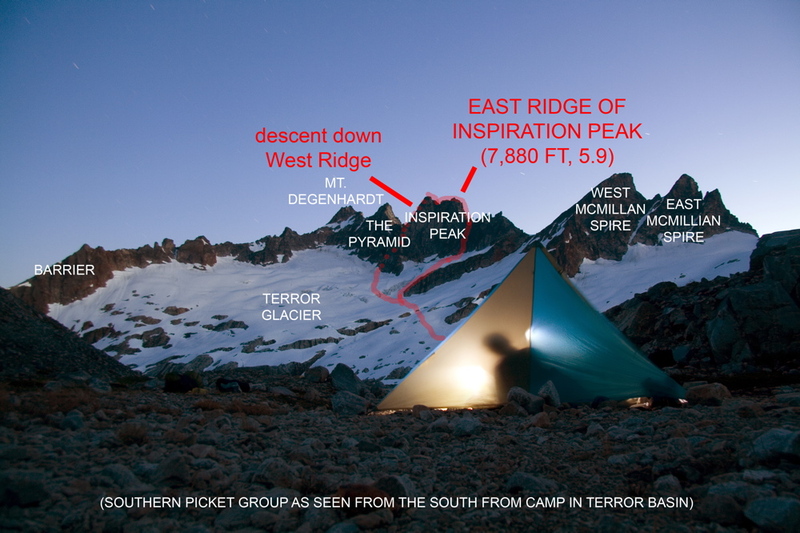 Since the trail starts just off Highway 20, for any climbing objective in the Southern Pickets you truly do climb the entire peak. 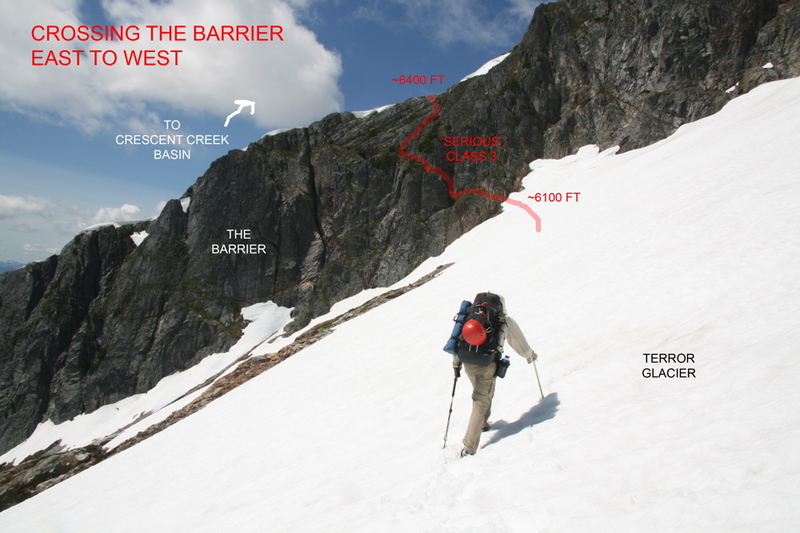 Once you break out of the trees at around 5,000ft, you make a rising traverse along meadows and slabs and snowfields to a 6,200ft saddle as shown in the photo. A great campsite is about 400 ft below this saddle on the other side. A nice camp in Terror Creek Basin at around 5,800ft. From here you get great views of (from left to right) The Barrier, Degenhardt, The Pyramid, Inspiration, and McMillan Spires. Compare the amount of snow to this photo taken in July 2005. The Big Dipper above the Southern Pickets (Degenhardt, The Phyramid, Inspiration, McMillan Spires). 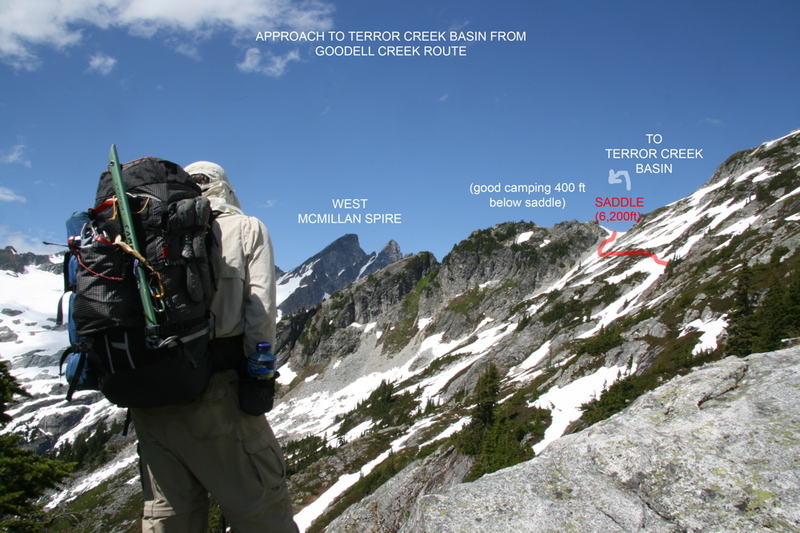 This photo shows the general route to and up the East Ridge of Inspiration from camp in Terror Creek basin. The climb took us 15 hours round trip. The approach to Inspiration Peak from our camp only took a couple of hours due to the early-season snowcover (this photo was actually taken the next day when we retraced some of the climbing route on our way to The Barrier). Some steep snow near the end of the approach to the East Ridge (we could have gone around on a more gentle slope, but this way was shorter and more exciting). Gearing up at the base of the climb. We simulclimbed the first few hundred feet of mid-fifth class rock up to the notch between the main east ridge of Inspiration and the towers. On the climb to the notch, we wandered upwards, occasionally switching leads, simulclimbing, and choosing whatever route looked best (note that I started counting pitches once we hit the notch). Negotiating the step between the snow and the rock. Ascending the mid-5th class rock to the notch. We just kind of wandered upwards, simulclimbing and choosing whatever route looked best. Steph belaying Jason up PITCH 1 from the notch, which is a 5.8 Layback. Photo by Donn. Jason on the 5.8 Layback section on PITCH 1 from the notch. The Layback is just right of an overhanging phallic shaped rock. Photo by Donn. PITCH 2 from the notch is a steep 5.9 crack (the crux). Watch out for some loose blocks in the crack on this pitch. Jason climbing up PITCH 3 from the notch, a blocky 5.7 climb to the base of the south summit. PITCH 4 from the notch is an exposed 5.7 traverse around the south side of the south summit. Looking towards the summit of Inspiration from the PITCH 4 traverse around the south summit. 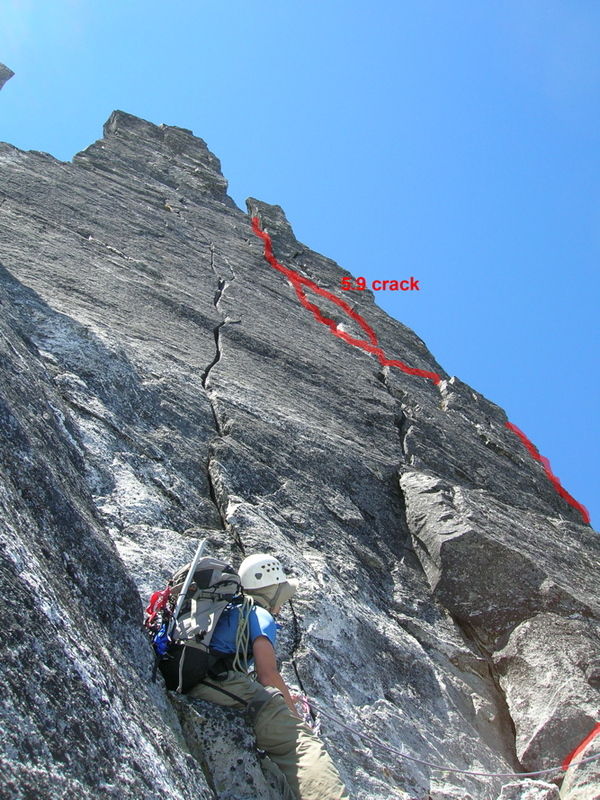 The FINAL PITCH of the climb is a fun low 5th class traverse along the exposed ridge leading to the summit. On the summit of Inspiration. 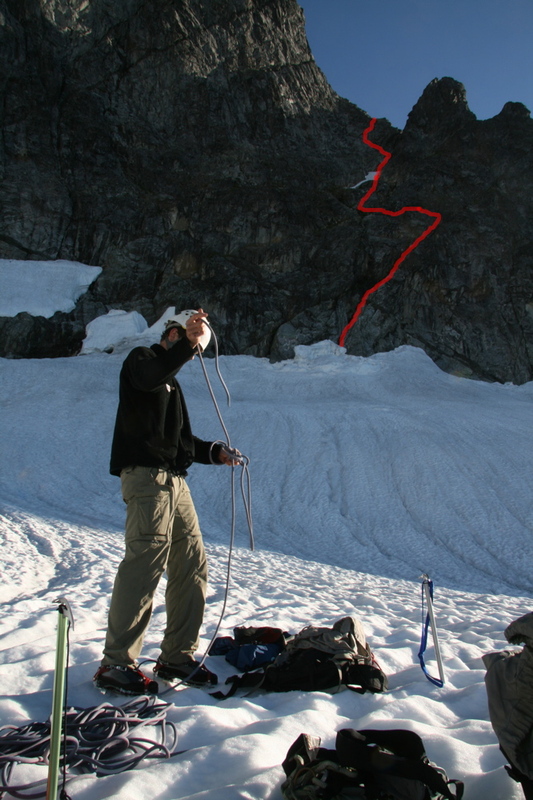 We made 7 double-rope rappels down the Wert Ridge route of Inspiration to get to Terror Glacier at the base of the West Ridge gully. We found a suitable rappel anchor for each double-rope rappel. One of the rappel anchors, just a couple of solid nuts. The gully at the base of the West Ridge of Inspiration. We rappelled into this gully. To access the West Ridge route you have to ascend this not overly pleasant but it could be much worse gully. The party we shared camp with had tried to cross The Barrier but could not find a feasible route. We were excited to tackle the challenge of the unknown. To cross The Barrier, we followed a steep and loose grassy ledge around 6100ft, and then got to easier territory where we were able to scramble straight up to the crest at around 6400ft. This is probably the "serious Class 3" route described in the Beckey Guide. Donn on a steep snow step onto the rock of The Barrier. "Serious Class 3 scrambling" over The Barrier. It was the kind of loose terrain where you did not want to slip. The Class 3 scrambling became a little more secure as we neared the crest of The Barrier. Photo by Donn. The Chopping Block as seen from our camp. We arrived at camp in the early afternoon, so we decided to climb the NW Route, which involves a 3rd Class scramble midway up the NE Ridge, then an exposed traverse across the North face on Class 4 ledges, and an easy Class 3 scramble up the remainder of the NW Ridge. To descend, we made a few single rope rappels down the NE Ridge. The traverse across the North face involves some tricky route finding along exposed Class 4 ledges. Jason traversing the exposed Class 4 ledges on the North face of the Chopping Block. Photo by Donn. 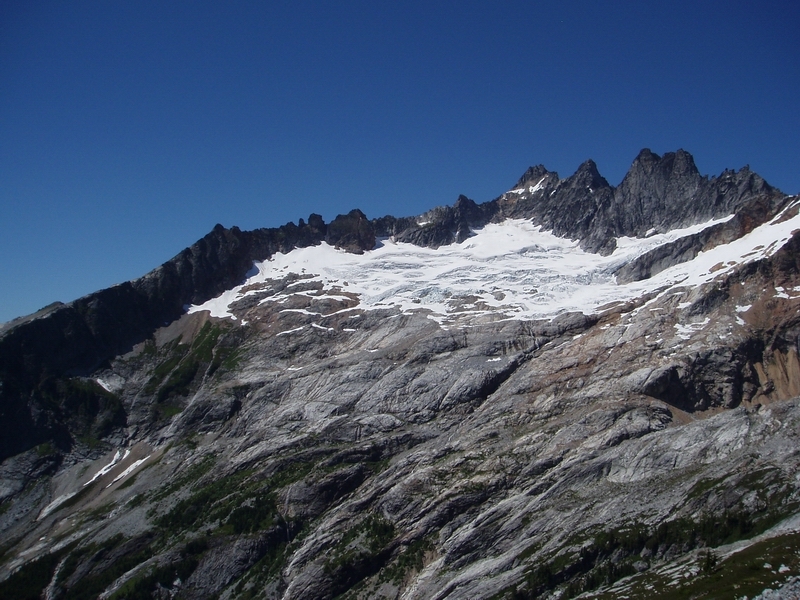 After traversing the North face, the rest of the climb is an easy Class 3 scramble up the NW Ridge to the summit. View from the summit of the Chopping Block. From here, you can see all of the Southern Picket peaks. Rappelling down the NE Ridge of the Chopping Block (this also looks like a fun climb). This photo was taken by Donn, who had conveniently arrived at the end of the rope in a great photo location. Every trip has to have at least one rope-unsticking episode. Filling up water back at camp. Due to the heavy snow cover, we had to search around a bit for water, but we found some trickling down an outcrop in the snow a few hundred feet below camp. We had a full moon and clear nights during our trip, so I didn't get much sleep. A moonlit night at camp on the Chopping Block ridge overlooking Crescent Creek Basin. 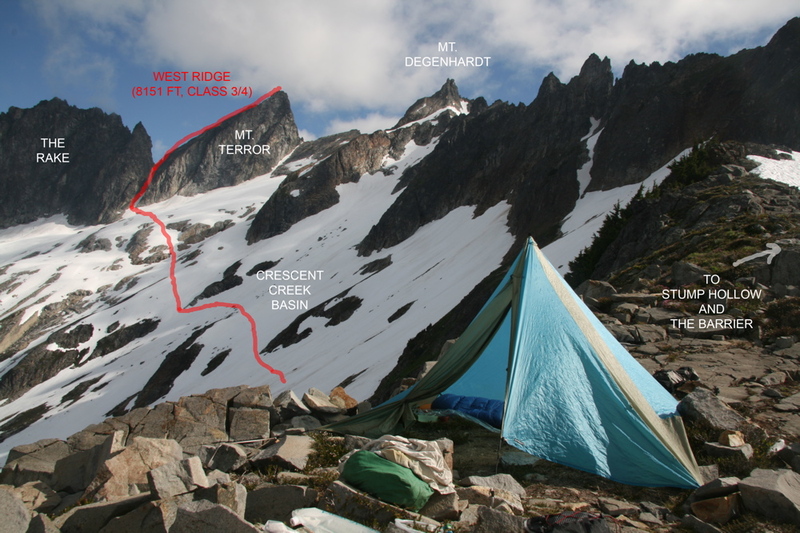 Our route to climb the Wert Ridge of Mt Terror, as seen from our camp on the Chopping Block ridge. This is mostly a fun Class 3 scramble. It was a good choice for the day's climb, since some low clouds obscured the visibility, and it also allowed us to scope out the descent route we would be taking for our proposed climb of the North Ridge of Terror in August. Jason crossing Crescent Creek Basin toward Mt. Terror in a whiteout. The early season snowcover made traveling easily. Ascending the steep snow in the gully to the West Ridge of Terror. We were thankful for the early season snowcover which made for a quick ascent. Looking up the West Ridge of Mt. Terror from the notch. The crest of the ridge is mostly Class 3 scrambling. Supposedly there is a Class 3 way to access the ridge, but we soon found ourselves on a fifth class variation. Donn belaying at the top of our fifth class variation to the ridge crest. An easy Class 3 scramble up the west ridge. The notch between the false summit and the true summit. The final Class 3/4 scramble up the West Ridge to the summit. Steph on the summit of Terror (or, you never know, maybe she is really at camp pretending to be on the summit….). Photo by Donn. We down climbed the entire West Ridge, and made 2 single-rope rappels where the ridge dropped off into the gully. Descending the gully from the west ridge down into Crescent Creek Basin. We tried not to take the snow for granted, as we knew that the next time we would be descending this gully in August (after our planned climb of the NR of Terror) the snow would have melted to uncover a steep chossy mess. Photo by Donn. During the night we were bombarded by a nalgene meteorite shower. Fortunately, they all missed the tent…. On the last morning, we woke up to a sea of clouds in the valleys below us. The Chopping Block in a sea of morning clouds. Is that a cell phone? Descending the snow, slabs, and heather of Stump Hollow as we made our way to the crest of the Barrier. 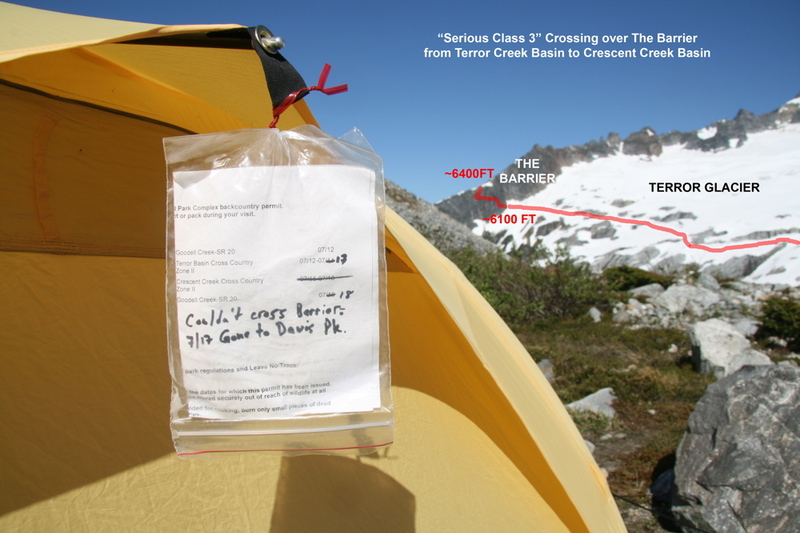 A faint path follows the crest of the Barrier from 5,600 ft to 3,600 ft.
A tree near the point where the route dives off the crest of the Barrier (at a minor saddle around 3,600 ft) to descend steeply down to Terror Creek. Descending the alternately brushy and cliffy slopes from the Barrier to Terror Creek. When we got to the creek crossing, we realized that we had been just right of a "trail" down the slope. Photo by Donn. Jason on the log crossing of Terror Creek (elev. 2000 ft). There are rough boot-beaten paths on either side of this crossing. Beer, chips, and stitches after a successful trip!